"America's Most Beloved Ballpark" is uniquely nestled in the city of Boston. Fenway Park is a place where dreams are made, traditions are celebrated and baseball is forever. See the home of Red Sox Legends, Williams, Yaz, Fisk and Rice. Visit Pesky's Pole and sit atop the world famous Green Monster which stands 37 feet 2 inches high overlooking left field. Experienced tour guides will provide a thrilling, one hour, walking tour of Fenway Park. Bilingual tours are available in Spanish and Japanese with advance notice. We welcome all fans to Fenway Park, home of the Boston Red Sox and the pulse of Red Sox Nation. Explore the historic grounds of Fenway Park, "America's Most Beloved Ballpark" and home to the Boston Red Sox. You will become enchanted by the fables and charm of this 104 year old monument. Experienced tour guides will provide a thrilling, one hour, walking tour of Fenway Park which will leave you inspired to learn more about Red Sox history and its appeal to baseball enthusiasts, historians, educational institutions, musicians, agriculture and architecture. Take in the magnificent sites and breathtaking views atop the Roof Deck overlooking right field. 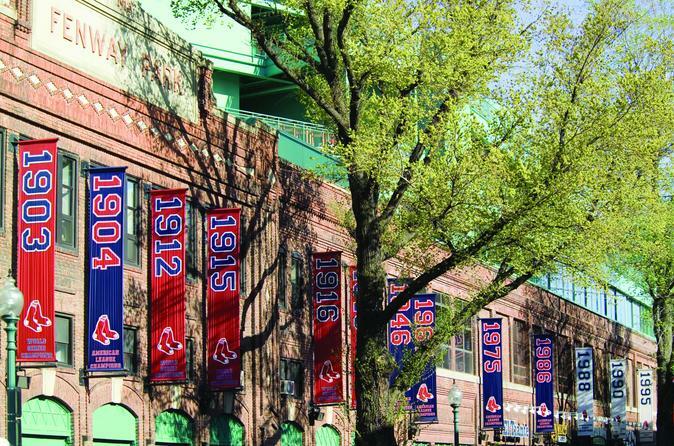 This authentic gem, so perfectly nestled in the city of Boston, is also home to celebrated World Champions from 1903, 1912, 1915, 1916, 1918, 2004, 2007 and 2013. A one of a kind experience that gives fans up close access inside the hallowed walls of Fenway Park, where Red Sox Legends, Williams, Yaz, Fisk, Rice, and Tiant played with honor. In 2012, on the 100th anniversary of Fenway Park, club ownership unveiled Fenway Park The Living Museum, which engages fans of all ages by showcasing the vast collection of memorabilia available to the general public, year-round through the Boston Red Sox Tour Department. Fenway Park is not only a local favorite, it is also an international tourist destination. Visited by fans from over 93 different countries. The mystical presence of Fenway Park transcends all cultures and time. Let our esteemed tour guides share their in-depth knowledge of all things Boston Red Sox. We encourage everyone taking a tour of Fenway Park to participate, enjoy, and take plenty of pictures. Below is a list of features visitors may see on tour. Fenway Park Tours are also available in Spanish, Japanese and in sign language with advance notice. We welcome all fans to Fenway Park, home of the Boston Red Sox and the pulse of Red Sox Nation. All tours are handicap accessible.